Yogurt is a healthy. Calcium rich treat full of beneficial pro-biotics the whole family can enjoy. It tastes great and is good for you, so what’s not to love? This healthy treat is easy to make at home. We are going to take a look at yogurt makers, give our yogurt maker reviews and see what the best yogurt maker is and what the best greek yogurt maker is. Does the Maker Include a Greek Yogurt Strainer? Is the Maker Equipped with Personal Size Containers or One Large Container? Is the Container Glass or Plastic? Do You Need to Pre-Heat the Milk? Does the Unit Have an Auto Shut Off Feature? What Other Special Features Does the Yogurt Maker Have? You could buy yogurt at the store, but often the premium brands can be quite expensive and many contain preservatives, too much sugar and other additives that detract from the health benefits yogurt has. Making yogurt at home can save money, puts you in control of what is in your yogurt and allows you to create any variety or flavors you like. You can even make specialty yogurt using soy, goat, almond or other non-dairy milks. Just about every yogurt maker will require you use a yogurt starter. The starter is what introduces the beneficial bacteria into the mix. The yogurt maker then incubates the bacteria, allowing it to multiply and turns the milk to yogurt. Some machines offer packets of dry starter, but that is not necessary. Starter is quite simple, its just plain, full fat yogurt. You can buy one container and use it for several batches of home made yogurt. Smaller containers are better because they have a higher turnover at the grocery store and are usually fresher than the large containers. Which model is the best Greek yogurt maker? One model we reviewed might be the best Greek yogurt maker because it includes a special strainer to make Greek yogurt- the Dash Greek Yogurt maker. Greek yogurt is not hard to make, it is simply regular yogurt which has been strained so the whey is reduced, making it thicker. Essentially any yogurt can be made into Greek yogurt. If your machine does not include a strainer there are several yogurt strainers on the market that will get the job done. Keep in mind that once you strain the yogurt, the volume or amount of yogurt you are left with is considerably less. Some yogurt makers have one large container, while others make individual serving sizes. Choose one that works for you. Some people like the individual containers, others find them a hassle to wash. It is really up to you, as it does not affect the performance of the yogurt maker. Some may prefer the durability of plastic, but plastic can leave a taste behind that you may notice in the yogurt, plus, plastic absorbs odors that can transfer to the next batch. Glass containers, while breakable, do not transfer or hold odors, and may be healthier than storing food in plastic. Some yogurt maker manufacturers recommend heating the milk to 180 degrees, while other yogurt makers say it is not necessary. If you are using pasteurized milk, heating is not necessary from a health standpoint. However, heating the milk leads to a creamier, firmer texture yogurt. If you like a firm texture, heating the milk to 180, then allowing it to cool to 110 degrees is a good choice. Heating the milk will contribute to the success of your batch of yogurt. This is a nice to have feature. Many yogurt makers have no automatic shut off, you must set a timer and remember to take the yogurt out. The longer you incubate yogurt the tarter it becomes, so you don’t want to leave it longer than necessary. A few yogurt makers do have auto shut off, and one of the best yogurt makers, a high end model we reviewed, shuts off automatically and begins to cool the yogurt. Yogurt makers on the whole are pretty basic machines. Their main function is to incubate the milk and starter mix until yogurt forms, keeping everything at a consistent temperature. Some models do have special features. The Cuisinart we reviewed has an auto shut off feature that stops when the yogurt is done, and then begins to cool the yogurt. The Euro YMX650 has individual glass jars with date selectors so you can dial in the date and know what day the yogurt was produced. 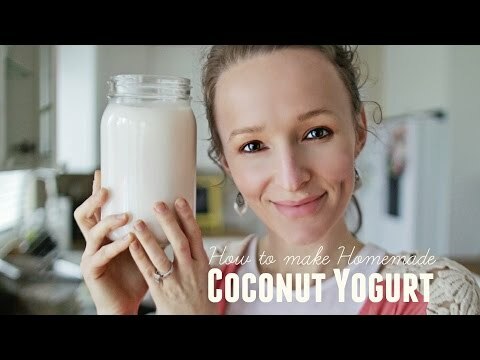 This is a handy feature because homemade yogurt does not last as long as store bought yogurt. The Dash Greek yogurt maker comes in a variety of colors. But at the end of the day, yogurt makers are all pretty similar. Heating the milk to 180 (some even go as high as 190) for 10 (or as long as 30) minutes and then cooling to 110 BEFORE adding your starter will make creamier and firmer yogurt. This is because the lacto globulin proteins in milk begin to break down at 174 degrees, which makes their protein available for yogurt creation. There is no need to use a dry starter mix. Plain full fat yogurt will work just as well, and one small container will make several batches. Another trick for making thick rich yogurt without straining is to add dry milk powder along with the yogurt starter. The best way to thicker yogurt is to make Greek style yogurt. Greek yogurt is simply regular yogurt that has been strained. You can strain the yogurt with a cheese cloth or yogurt strainer. Homemade yogurt has a shorter lifespan than store-bought. It lasts for about 7 to 10 days in the fridge. It is a good idea to mark the container with a made on date so you know if the yogurt is still good. For a ridiculously rich yogurt, use half and half in place of whole milk. Add sweeteners after the yogurt has chilled to avoid inadvertently feeding unwanted bacteria. Seven individual serving size glass containers. This is a small unit and does not take up much space on the counter. You can use all kinds of milk to make yogurt. The lids on jars don’t always fit well. This yogurt maker has no option for Greek yogurt. This yogurt maker has no timer so you need to watch or set your own timer to know when it is done. This is a very basic, budget machine that gets the job done. It includes 7 glass jars that make individual servings of yogurt. Some people use their own pint size mason jars or even one glass bowl instead of the provided jars, and that works just fine and makes the machine pretty versatile. The unit has no timer, so while you can set it and go, you better come back before it is done or set your own timer. This machine has a LED light on the front to let you know the unit is turned on. It also includes a user manual with easy to make 2 minute recipes. Can use all milk types. The odd shape of the jars can be a challenge to clean. Sometimes the unit gets too hot toward the center. This Euro Cuisine YM80 model is essentially identical to the Epica set and go. The minor difference is a slight variation in jar shape. This model makes individual servings in glass jars, or can be used with your own glass container. You can also use half pint mason jars if you want to make batch after batch. The yogurt maker has no auto shut off and is about the same price as the Epica, so it is a toss up between these two. Both work well. This unit has an on/off switch and an LED light indicating the unit is on. This yogurt maker has a self-timer. Includes a Greek yogurt strainer. It is very compact, a great size for the kitchen. The yogurt maker has cord storage on the back side. Several fun colors are available for this model. 5 cup capacity max, which is an odd amount because it does not match any milk container sizes, so you might have leftover milk. The Greek yogurt strainer is not big enough to hold all the contents from the main container, making straining a hassle. This is our choice for the best Dash Greek Yogurt maker review. This yogurt maker has the Greek strainer feature, which is great, except it does not hold the entire contents of the yogurt container, so you need to strain the yogurt in two batches. The max capacity of the unit is 5 cups, which is also off, since milk does not come in 5 cup increments from the store, so that can be awkward. The directions call for double boiling the milk, which does make for a creamier and thicker yogurt, but you will need a thermometer to get the temperatures correct. This fancy yogurt maker from Cuisinart has an auto shut off timer. This is the only self-cooling unit. After your yogurt is done, the unit stops the incubation process and goes into self-cooling mode. You can adjust the timing of the incubation cycle. Clear, easy to read LED display. Best yogurt maker for scd, as the timer can be set for a full 24 hours. Only makes 1.5 quarts at a time. This is a pricier unit with the benefit of having an auto shut off feature that cools the yogurt for you, something other yogurt makers do not do. It has a nice LCD interface and is easy to use. While it does not have a Greek yogurt strainer, the yogurt can be strained using a cheese cloth of other strainer made for this purpose. Some may not like the fact that the yogurt container is plastic as many folks prefer glass. This is an attractive yogurt maker with brushed aluminum detailing and does not take up a lot of space on the counter. Also, as a bonus to those on the SCD diet, this is the best yogurt maker for SCD, because you can manually set the timer to ferment for a full 24 hours, and then it goes into chill mode. How easy is that? The top of the unit provides storage for the jar lids. Up to 15 hour timer. Yogurt lids have date selectors to tell you how long the yogurt is good for. This yogurt maker has a shut off timer. 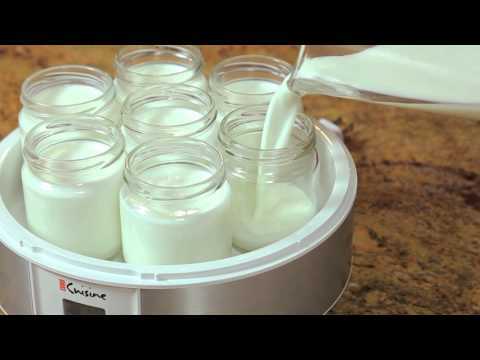 This yogurt maker tends to get hot towards the center so the jars don’t heat evenly. This is our choice for the best automatic yogurt maker. It’s a decent yogurt maker and many will appreciate the glass jars, individual serving containers and the auto timer which shuts the unit off. This yogurt maker does have its limitations however. It tends to get hot in the center and the jars can be a chore to clean. The date selector on the jars is a nice feature to let you know when the yogurt is no longer fresh, we did not see a similar feature in other models. Newly redesigned and improved mixing paddle. No ice needed, insulated bowl. One of the fastest frozen Yogurt makers out there. The unit has an odd “new product” smell at first that dissipates with use. Our Cuisinart frozen yogurt maker reviews showed us this model is king of the kitchen when it comes to making frozen yogurt and ice cream. If you want a low calorie alternative to ice cream, frozen yogurt is the way to go, and this frozen yogurt maker will make you a low fat frozen treat in about 15 to 20 minutes. The manual includes recipes for ice cream, sorbets and frozen yogurt, so you can try one of those or use your own recipe. Cuisinart has done it again, as this is one of the best frozen yogurt makers we found. We hope these 5 reviews will help you find the best yogurt maker for your needs and the question – what is the best yogurt maker – will no longer be a problem.